The two-component regulatory system, involving the histidine sensor kinase DegS and response regulator DegU, plays an important role to control various cell processes in the transition phase of Bacillus subtilis. The degU32 allele in strain 1A95 is characterized by the accumulation of phosphorylated form of DegU (DegU-P). Growing 1A95 cells elevated the pH of soytone-based medium more than the parental strain 168 after the onset of the transition phase. The rocG gene encodes a catabolic glutamate dehydrogenase that catalyzes one of the main ammonia-releasing reactions. Inactivation of rocG abolished 1A95-mediated increases in the pH of growth media. Thus, transcription of the rocG locus was examined, and a novel 3.7-kb transcript covering sivA, rocG, and rocA was found in 1A95 but not 168 cells. Increased intracellular fructose 1,6-bisphosphate (FBP) levels are known to activate the HPr kinase HPrK, and to induce formation of the P-Ser-HPr/CcpA complex, which binds to catabolite responsive elements (cre) and exerts CcpA-dependent catabolite repression. A putative cre found within the intergenic region between sivA and rocG, and inactivation of ccpA led to creation of the 3.7-kb transcript in 168 cells. Analyses of intermediates in central carbon metabolism revealed that intracellular FBP levels were lowered earlier in 1A95 than in 168 cells. A genome wide transcriptome analysis comparing 1A95 and 168 cells suggested similar events occurring in other catabolite repressive loci involving induction of lctE encoding lactate dehydrogenase. Under physiological conditions the 3.7-kb rocG transcript may be tightly controlled by a roadblock mechanism involving P-Ser-HPr/CcpA in 168 cells, while in 1A95 cells abolished repression of the 3.7-kb transcript. Accumulation of DegU-P in 1A95 affects central carbon metabolism involving lctE enhanced by unknown mechanisms, downregulates FBP levels earlier, and inactivates HPrK to allow the 3.7-kb transcription, and thus similar events may occur in other catabolite repressive loci. Bacteria possess two-component regulatory systems comprising environmental sensor histidine kinases and cognate response regulators that are involved in adaptation to various chemical, physical, and physiological stimuli . Following stimulation, autophosphorylation of specific sensor histidine kinases leads to transfer of a phosphoryl group to cognate transcriptional response regulators that control respective target genes. In Bacillus subtilis, the DegS–DegU two-component regulatory system controls various processes during the transition from exponential to stationary growth phases, including the expression of extracellular degradative enzymes and late competence genes . The phosphorylated form of DegU (DegU-P) induces a number of genes, whereas the unphosphorylated form also stimulates transcription of comK, which encodes the competence transcription factor [3,4]. In addition, DegU-P negatively regulates genes of the sigma factor SigD regulon, which are involved in motility, chemotaxis, and autolysin production [2,5,6]. In addition, the DegS–DegU system is modulated by two regulatory genes, degQ and degR, which encode small polypeptides of 46 and 60 amino acids, respectively . In wild-type strains, DegQ enhances phosphorylation of DegU , whereas DegR protects DegU-P from dephosphorylation . In contrast in the standard laboratory strain 168, due to a mutation in the −10 region (T-10 to C) of its cognate promoter, degQ is not efficiently transcribed, and DegU-P does not accumulate as in wild-type strains . In the previous studies, mutations in DegU led to overproduction of extracellular degradative enzymes and correlated with the loss of natural competence for DNA uptake, the lack of flagella synthesis, filamentous morphology, and higher sporulation efficiency in the presence of glucose [11-13]. Among these mutations, the allele degU32 in strain 1A95 has an amino acid substitution at position 12 . This mutation increases the stability of DegU-P sevenfold, and amplifies DegU-P dependent gene expression even with the genetic background of strain 168 . Extracellular proteomic studies of the degU32 mutant indicated that 13 extracellular enzymes are overproduced and that eight proteins of motility and cell-wall turnover were significantly downregulated, including five SigD-dependent proteins . The subsequent transcriptome analysis confirmed similar induction and repression of the known DegU-P and DegU dependent genes, respectively . Bacterial carbon catabolite repression (CCR) is a global regulatory mechanism that occurs in the presence of a preferred carbon source and represses genes involved in metabolism of other minor carbon sources, coordinating metabolic responses to efficient carbon and energy sources. In B. subtilis, CCR occurs primarily at the transcription level and involves phosphorylation of CcpA and HPr at the Ser-46 residue (P-Ser-HPr) . Preferred carbon sources such as glucose are readily converted into glycolytic intermediates, including fructose-1,6-bisphosphate (FBP), and the accumulation of intracellular FBP stimulates HPr kinase/phosphatase, which phosphorylates HPr to P-Ser-HPr. CcpA is a member of the LacI/GalR family of transcriptional regulators, which are synthesized constitutively irrespective of the presence or absence of repressing sugars. The CcpA/P-Ser-HPr complex is formed only in response to P-Ser-HPr, and exerts site-specific DNA-binding activity with 14-bp cis-acting palindromic sequences that are known as catabolite responsive elements (cre). Because DNA binding of CcpA/P-Ser-HPr interferes with both initiation and elongation of target gene transcription under CCR, CcpA/P-Ser-HPr functions as a classical repressor and a transcriptional roadblock. In contrast, HPr originally functions as the energy coupling protein of the phosphotransferase system (PTS), which mediates carbohydrate transport following phosphorylation of the His-15 residue. B. subtilis expresses the two glutamate dehydrogenase genes gudB and rocG. In the standard laboratory strain 168 and its derivatives, gudB is a cryptic gene with a short repeat within the coding region, whereas in the wild-type B. subtilis strains this gene encodes an intact enzyme . Potentially, the ancestral gudB gene became inactive during domestication under laboratory conditions. In contrast, RocG functions as an active catabolic glutamate dehydrogenase and is induced in the presence of arginine, ornithine, or proline following transcriptional activation of the SigL-dependent promoter and enhancement by the transcription factor RocR . RocG is also regulated by CcpA-dependent CCR, involving a cre situated just downstream of the rocG promoter . Moreover, RocG is involved in ammonia-releasing reactions during the production of the Japanese food natto, which is produced by fermentation of soybeans using strains of B. subtilis natto that are equivalent to wild-type B. subtilis strains . As described above, 1A95 cells carry the degU32 mutation on the genetic background of the laboratory strain 168. In the present study, we noticed that the pH of soytone-based medium significantly increased during growth of 1A95 cells after the onset of the transition phase. Thus, we speculated that this change in pH reflects ammonia release following glutamate degradation by RocG. Subsequent investigations of transcription in the rocG locus revealed a novel transcript in 1A95 cells. Further experiments indicated that hyperphosphorylation of DegU may proactively abolish CcpA-dependent CCR, modulating the regulatory network involving intracellular metabolites and phosphorylation of HPr. During growth of B. subtilis strains in soytone–glucose medium, pH levels decreased to around 5.5 prior to transition from the logarithmic to the stationary phase, and then increased during the stationary phase (Figure 1). However, pH levels gradually increased to around 6.5 and no higher than 7.0 during growth of the laboratory standard strain 168, whereas the 1A95 (degU32) strain significantly elevated pH to almost 8.0. Involvement of rocG in elevated pH and ammonia levels in the growth medium of strain 1A95 (degU32). (A) Growth curves of B. subtilis strains 168 (closed squares) and TM013 (rocG::cat, closed diamonds) in the soytone–glucose medium; pH values are indicated for 168 (open squares) and TM013 (open diamonds) cultures. (B) Growth curves of strains 1A95 (degU32, closed squares) and TM014 (degU32 rocG::cat, closed diamonds) in the soytone–glucose medium; pH values are indicated for 1A95 (open squares) and TM014 (open diamonds) cultures. (C) Levels of ammonia in media at 12 (gray bars) and 24 (black bars) h after inoculation. rocG encoding glutamate dehydrogenase mediates ammonia-releasing reactions during secondary natto fermentation . Thus, we suspected that ammonia may contribute to increases in the pH of growth media, and observed ammonia accumulation in the culture medium of 1A95 cells (Figure 1). Inactivation of rocG in the 168 strain only had a slight effect on pH and ammonia accumulation (Figure 1A and C, strain TM013). However, inactivation of rocG in 1A95 cells prevented increases in pH and accumulation of ammonium, which remained at similar levels to those observed in 168 cells (Figure 1B and C, strain TM014). These data indicate that degU32 contributes to increases in pH, potentially by enhancing RocG-mediated release of ammonia. Total RNAs were extracted from cells during the transition from logarithmic to stationary phases, just prior to pH increases (Figure 1B). In subsequent northern blotting analyses (Figure 2), three mRNA species containing rocG were detected in 1A95 cells under low-stringency conditions, with sizes of 5.0, 3.7, and 1.5 kb (Figure 2A). Control of rocG by RocR reportedly activates the SigL-dependent promoters for rocABC, rocDEF, and rocG in the presence of arginine metabolites such as citrulline and ornithine [19-21]. Both 5.0- and 1.5-kb transcripts were detected in 168 cells, but were not present in TM016 cells (degU32 rocR::kan). These observations indicate probable dependence of these two transcripts on rocR but not on degU32, although further experiments were not performed on these transcripts because they were not detected under high-stringency conditions (see below). The signals for the 1.5-kb transcript were rather exaggerated probably due to a synergistic effect of non-specific hybridization to 16S rRNA under the low-stringency conditions. In contrast, appearance of the 3.7-kb transcript depended solely on degU32 in 1A95 and TM016 cells and was not present in strains 168 and TM015 (degU32::cat), indicating that this novel 3.7-kb transcript may enhance the function of RocG in 1A95 cells. Northern blotting analyses of transcripts containing rocG , sivA , and rocA. RNAs were prepared from 168 (lane 1), 1A95 (degU32, lane 2), TM015 (degU32::cat, lane 3), and TM016 (degU32 rocR::kan, lane 4) cells for northern blotting analyses using probes for rocG (A), sivA (B), and rocA (C) transcripts under low-stringency conditions. (D) RNAs were prepared from 1A95 (degU32, lane 1), TM016 (degU32 rocR::kan, lane 2), TM017 (sivA::pMutin2, lane 3), and TM018 (degU32 sivA::pMutin2, lane 4) cells for northern blotting analyses using probes for rocG transcripts under high-stringency conditions; rRNAs (23S and 16S) on membranes were visualized as a loading control using methylene blue staining. Gene organization of the rocG locus is shown at the bottom. The 3.7-kb transcript was weakly but substantially detected under low-stringency conditions using either sivA (formerly yweA) or rocA probes in 1A95 and TM016 cells (Figure 2B and C), suggesting coverage of rocG, sivA, and rocA. A very strong 0.6-kb sivA transcript was observed in all four strains, suggesting transcription from a constitutive promoter upstream of sivA (Figure 2B). The probe for rocA detected another 1.5-kb transcript in 168, 1A95, and TM015 cells, but not in TM016 cells, suggesting dependence on rocR (Figure 2C). Even under high-stringency conditions, the 3.7-kb transcript was clearly detected using the rocG probe in 1A95 and TM016 cells, but was absent after disruption of sivA in TM018 cells (degU32 sivA::pMutin2; Figure 2D). The 5.0- and 1.5-kb rocG transcripts observed under low-stringency conditions (Figure 2A) were not detectable under high-stringency conditions in 1A95 cells (Figure 2D), suggesting that the 3.7-kb transcript could be the major rocG transcript in 1A95 cells and is dependent on degU32. Primer extension analyses revealed a transcription start site at 97 bases upstream of the translation start site of sivA (Figure 3). Thus, the corresponding promoter may comprise the −35 (TTTACT) and −10 (TAGATT) regions with a 17-bp spacer and may be a typical SigA-dependent one. The constitutive 0.6-kb transcript may be the main sivA transcript, and is produced independently of degU32 or rocR (Figure 2B). Accordingly, the present northern analyses (Figure 2B) and a previous study indicate that transcription from the sivA promoter may be independent of both SigL and RocR . The promoter and terminator regions of sivA. (A) Primer extension analyses of the sivA promoter region; RNAs were prepared from 168 (lane 1) and 1A95 (degU32, lane 2) cells, and were reverse transcribed to generate cDNAs corresponding to the 5′-terminus of sivA transcripts. Lanes G, A, T, and C contained dideoxy sequencing ladders. The partial nucleotide sequence of the coding strand is shown on the right side, where the putative −10 region and the transcription start site (+1) are shown in enlarged uppercase characters. (B) Schematic presentation of the sivA promoter region. The nucleotide sequence of the upper strand of the promoter region is shown, and putative −35 and −10 regions, the transcription start site (+1), and the beginning of the sivA open reading frame are shown with enlarged uppercase characters. (C) Nucleotide sequence of the intergenic region between sivA and rocG. The C-terminal end of sivA, the Rho-independent terminator, SigL-dependent rocG promoter (+35 and −10 regions), its transcription start site (+1), the cre site, and the N-terminal end of rocG are indicated. A previous study indicated that rocG is regulated by CcpA-dependent CCR, involving a putative cre site in the intergenic region between sivA and rocG . Moreover, the sivA transcript may be read through to cover downstream rocG . CcpA-dependent CCR involves not only repression of transcriptional initiation at promoter sites but also a roadblock mechanism that aborts ongoing transcription . Along with previous results, the present data suggest that the 3.7-kb transcript is produced by transcription through the main 0.6-kb sivA and elongation to cover both rocG and rocA, and thus escapes CcpA-dependent CCR. Although a Rho-independent terminator (ΔG = −16.90 kcal/mol, Figure 3C) is present and may terminate transcription from the sivA promoter, it may allow some read through. Moreover, CcpA-dependent CCR may arrest the read via the roadblock mechanism in 168 cells but not in 1A95 cells. It was previously shown that rocABC composed a single 5.0-kb transcriptional unit depending on both SigL and RocR . Another northern blotting analysis revealed that a rocB specific probe detected the 5.0-kb transcript but failed to detect the 3.7-kb one (Additional file 1: Figure S1). Recently an internal terminator was found just behind rocA [24,25], and this terminator could function in this case to generate the 3.7-kb transcript covering sivA, rocG, and rocA. The SigL-dependent rocG promoter and its corresponding transcription start site are located upstream of the cre site . Therefore, the CcpA-dependent roadblock might also control SigL-dependent rocG transcription. When ccpA was inactivated (ccpA::neo) in strain 168, the 3.7-kb transcript containing rocG was produced as in 1A95 cells (Figure 4; note that the 5.0- and 1.5-kb transcripts were not detected under high-stringency conditions). These observations indicated that the 3.7-kb transcript was repressed by CcpA-dependent CCR in 168 cells and was likely “induced” in the 1A95 (degU32) strain, allowing proactive abolition of the CcpA-dependent CCR roadblock at the cre in the intergenic region between sivA and rocG (Figure 3C). However, the ccpA mutation in 168 produced an additional 2.7-kb transcript that remains uncharacterized. Northern blotting analyses of rocG transcripts in the presence and absence of ccpA. RNAs were prepared from 168 (lane 1), TM023 (ccpA::neo, lane 2), 1A95 (degU32, lane 3), and TM024 (degU32 ccpA::neo, lane 4) cells for northern blotting analyses using a probe for rocG transcripts under high-stringency conditions. Experiments were repeated independently at least three times with similar results, and representative data are shown. At the bottom, rRNAs (23S and 16S) were visualized as loading controls using methylene blue staining. To investigate abolition of CcpA-dependent CCR in 1A95 (degU32) cells, intracellular intermediates of central carbon metabolism were determined by capillary electrophoresis–mass spectrometry (CE–MS) analysis and compared with those in 168 cells (Figure 5). FBP levels decreased during the growth in both strains, and the decrease occurred faster in 1A95 cells. Glucose 6-phosphate (G6P) levels also decreased in 1A95. In contrast, 3-phosphoglyceric acid (3PG), phosphoenolpyruvate (PEP), and pyruvate (PYR) levels were consistently lower in 1A95 cells than in 168 cells. Thus, glycolysis might proceed more efficiently in 1A95 than in 168 cells, and the faster reduction in the FBP levels led to an earlier alleviation of CcpA-dependent CCR. On the other hand, in both strains, levels of intermediates of the pentose phosphate pathway, including 6-phosphogluconate (6PG), ribulose 5-phosphate (Ru5P), and sedoheptulose 7-phosphate (S7P), were generally lower than the glycolytic intermediates, such as G6P, FBP, and 3PG, nevertheless some significant effects of degU32 were seen to lower the levels of intermediates in the pentose phosphate pathway. Potentially, glycolysis might consume glucose more efficiently in 1A95 cells, as reflected by lower levels of 6PG, Ru5P, and S7P. Intracellular levels of central carbon metabolism intermediates. Cells of 168 (closed squares) and 1A95 (degU32, open squares) strains were grown in the soytone–glucose medium and intracellular metabolites were extracted at the indicated time points after inoculation for CE–MS analyses. Experiments were repeated independently for three times, and the mean values are shown with standard deviation. Intermediates are abbreviated as follows: glucose 6-phosphate, G6P; fructose-1,6-bis-phosphate, FBP; 3-phosphoglyceric acid, 3PG; phosphoenolpyruvate, PEP; pyruvate, PYR; 6-phosphogluconate, 6PG; ribulose 5-phosphate, Ru5P; and sedoheptulose 7-phosphate, S7P. Transcriptome analyses were performed to compare 168 and 1A95 during transition from the logarithmic to the stationary phase. Among 25 selected genes of glycolysis, pentose phosphate, and branching fermentation pathways for lactate, acetoin, and acetate production, lctE, ackA, and gntZ, were enhanced by 5.44-, 5.86-, and 4.53-fold, respectively, in 1A95 cells compared with 168 cells (Table 1). lctE for lactate dehydrogenase was prominently expressed in 1A95 cells and its inactivation led to disappearance of the 3.7-kb transcript containing rocG (Figure 6) and maintenance of high intracellular FBP levels (Figure 7). Thus, degU32 in 1A95 cells may enhance the expression of lctE through unknown mechanisms. Because PYR is the end product of glycolysis, rapid clearance of PYR due to its conversion into lactate by lactate dehydrogenase (LctE) might accelerate glycolysis, and lower intracellular FBP levels might cancel CcpA-dependent CCR earlier. gntZ for 6PG dehydrogenase is part of the gntRKPZ operon for gluconate catabolism , which is induced specifically in the presence of gluconate and repressed with glucose via CcpA-dependent CCR . There is an additional promoter upstream of gntZ (within the gntP coding region), which allows transcription of gntZ independently . Although this gntZ-specific transcription is not under CCR, it might be involved in the enhanced expression. ackA for acetate kinase is positively regulated by CcpA in the presence of glucose [29,30], involving either phosphorylated HPr or Crh . Therefore, when FBP levels get lower, ackA was expected to be down regulated. But under the present conditions, ackA was induced probably due to CodY function as discussed below. aDetailed results are available in the ArrayExpress database  under accession number E-MTAB-2944. bSome representative genes under direct CcpA-dependent CCR , and selected genes (italic) of glycolysis, pentose phosphate, and branching fermentation pathways to lactate, acetoin, and acetate, are listed in descending order of ratio (1A95/168). Northern blotting analysis of rocG transcripts in the presence and absence of lctE. RNAs were prepared from 168 (lane 1), TM023 (ccpA::neo, lane 2), MY02 (lctE::spc, lane 3), 1A95 (degU32, lane 4), TM024 (degU32 ccpA::neo, lane 5), and KI004 (degU32 lctE::spc, lane 6) cells for northern blotting analyses using probes for rocG transcripts under high-stringency conditions. Experiments were repeated independently at least three times with similar results, and representative data are shown. At the bottom, rRNAs (23S and 16S) were visualized as loading controls using methylene blue staining. Intracellular levels of FBP in the presence and absence of lctE. Cells of 168 (closed squares), 1A95 (degU32, open squares), and KI004 (degU32 lctE::spc, open triangles) cells were grown in the soytone–glucose medium, and intracellular metabolites were extracted at the indicated time points and were analyzed using CE–MS. Experiments were repeated independently for three times, and the mean values are shown with standard deviation. As described above, expression of degU32 lowered intracellular FBP levels earlier, potentially reflecting an effect on global CcpA-dependent CCR. Accordingly, transcriptome analyses revealed that expression levels of some other genes that are regulated by CcpA-dependent CCR  were enhanced in 1A95 cells in the transition state (Table 1). Thus, ptsGHI, licRBCA, and deoR-dra-nupC-pdp were examined in specific northern blotting analyses using RNAs from transitioning cells grown in the soytone–glucose medium (Figure 8). Northern blotting analyses of transcripts containing ptsG , licC , and dra. RNAs were prepared from 168 (lane 1), TM023 (ccpA::neo, lane 2), 1A95 (degU32, lane 3), TM024 (degU32 ccpA::neo, lane 4), and TM015 (degU32::cat, lane 5) cells for northern blotting analyses using probes for ptsG (A), licC (B), and dra (C) transcripts under higher-stringency conditions. Experiments were repeated independently at least three times with similar results and representative data are shown; rRNAs (23S and 16S) are shown on the membranes as loading controls. Genetic schemas of respective loci are shown below. The ptsGHI operon encodes the glucose-specific PTS sugar transport system and is induced following interactions between the terminator immediately downstream of the promoter of ptsG and the specific antiterminator GlcT, which is activated by glucose . In a previous report, a putative cre site located upstream of the translation initiation point of ptsG did not function in CCR in cells grown in LB medium . However, the present northern blotting analyses of ptsG revealed a 4.6-kb transcript in TM023 (ccpA::neo), 1A95 (degU32), and in TM024 (degU32 ccpA::neo) cells, but not in 168 or TM015 (degU32::cat) cells (Figure 8A). This 4.6-kb transcript is of sufficient size to cover the entire operon, and appeared in a similar manner to the 3.7-kb transcript containing rocG. The lic operon encodes another PTS sugar transport system for the polysaccharide lichenan . A 2.0-kb transcript containing licC appeared in both 168 and 1A95 cells, whereas another 4.0-kb transcript was present in the strains carrying degU32 or ccpA::neo, and then disappeared upon inactivation of degU32 (Figure 8B). This 2.0-kb transcript may correspond with licBCA, and the 4.0-kb transcript may reflect licRBCA. Moreover, a cre site in the intergenic region between licR and licB  may be involved in CcpA-dependent CCR in 168 cells. The dra-nupC-pdp operon is required for catabolism of deoxyribonucleoside , and although its transcription in 168 cells is strongly inhibited by glucose, it can be restored by introducing point mutations in the cre site within the reading frame of dra . As shown in Figure 8C, both 3.4- and 4.3-kb transcripts containing dra appeared in the presence of degU32 and ccpA::neo. A smaller 0.6-kb transcript might correspond to the monocistronic dra transcript, which was also dependent on degU32 but not on ccpA::neo by unknown reason. Taken together, the present northern blotting analyses of ptsGHI, licRBCA, and deoR-dra-nupC-pdp operons suggest that degU32 affects rocG and other CcpA-dependent CCR targets. Numerous studies of CCR have been performed using the B. subtilis strain 168 as a model of gram-positive bacteria, and the mechanisms of CcpA-dependent CCR reportedly involve formation of a regulatory cre-site-binding complex by CcpA and P-Ser-HPr. CcpA-dependent CCR occurs naturally in 168 cells grown in the soytone–glucose medium containing 2% glucose. In contrast, DegU-P accumulated in 1A95 cells due to the degU32 mutation, and the presence of a novel 3.7-kb transcript containing rocG suggested that CcpA-dependent CCR was proactively abolished. Most of the described genes that are regulated by the DegS–DegU system are related to flagella formation, secretion of degradative enzymes such as protease and amylase, and biofilm formation [38,39]. Although few studies reported that DegS–DegU regulated genes for intracellular metabolic enzymes, depletion of nitrogen sources reportedly increased transcription of degU through an interaction between TnrA and GlnA, which affected metabolism of nitrogen sources . In the present study, the degU32 mutation led to accumulation of DegU-P and elevated expression of lctE, which encodes a lactate dehydrogenase that may enhance lactic acid synthesis in B. subtilis. Under anaerobic conditions, growing cells produce ATP and consume glycolytic intermediates by alternative respiration using the electron acceptor nitrate instead of oxygen or by fermentation to produce acetone, lactic acid, and acetolactate . However, under the present aerobic conditions, cells did not need to produce lactic acid for energy production. Therefore, the counter-intuitive increase in lactic acid synthesis may promote clearance of glycolytic intermediates, including FBP, and may reflect inactivation of HPrK, reduced CcpA/P-Ser-HPr activity, and CCR blockade. Schilling and colleagues  compared intracellular metabolites of aerobically cultured B. subtilis in glucose minimal medium with and without succinic acid and glutamic acid supplementation. The supplementation strongly lowered oxaloacetate synthesis but increased lactic acid synthesis significantly. Thus, the presence of organic acid in addition to glucose may induce lctE transcription and expression of lactate dehydrogenase, which plays an important role in the control of the intracellular redox state. Transcriptional control of lctE has predominantly been examined under anaerobic conditions, and another two-component system involving ResD–ResE , the intracellular NAD+ and NADH redox sensor Rex , the two ECF sigma factors SigW and SigV , and a global regulator CodY  have been identified to be involved. The ResD–ResE system functions in global regulation of aerobic and anaerobic respiration and activates resA, ctaA, qcrABC, and fnr [47,48]. Transcription of lctE is controlled directly by Fnr, which is an integral part of the regulatory cascade required for adaptation of bacteria to low oxygen tension . B. subtilis Fnr differs structurally from that in other bacteria such as E. coli, and its unique functions have not been fully characterized . Nonetheless, mutations in the two Fnr-binding sites within the lctE promoter region disabled induction of the promoter activity , indicating that lctE may be regulated by the ResD–ResE system through Fnr. DegU-P recognizes and binds DNA carrying the relatively poorly conserved sequence motif AGAA-N11-TTCAG, and corresponding sequences are found within the promoter regions of a number of genes that are regulated by degU, including wapA, sacB, sacXY, aprE, degR, degQ, srfAB, comC, comG, comEA, and mecA [16,51,52]. In contrast, non-phosphorylated DegU reportedly binds DNA with inverted repeat sequences with the consensus ATTTA-N7-TAAAT , which is similar to sequences in the promoter regions of fnr and lctE (data not shown). However, further studies are required to determine whether lctE is regulated by non-phosphorylated degU. Moreover, at present we are unable to explain the mechanism how lctE was induced upon hyperphosphorylation of DegU. Our transcriptome analyses revealed that ackA and gntZ were induced for 5.86-, and 4.53-fold in 1A95 cells, respectively. Especially, the induction of ackA seemed contradictory, because ackA is under positive regulation of CcpA/P-Ser-HPr and CcpA/P-Ser-Crh  and thus could be down regulated as FBP levels get lower. However, it is also known that ackA is induced by CodY in the presence of branched-chain amino acids . 1A95 secretes extracellular proteases efficiently , and they could degrade soybean peptides in soytone–glucose medium to provide more branched-chain amino acids, which thus might trigger the CodY-dependent induction. On the other hand, gntZ is the last gene of the gntRKPZ operon for gluconate catabolism , which is under the control of two promoters; the one is the gnt promoter induced specifically in the presence of inducer gluconate and repressed with glucose via CcpA-dependent CCR , and the other just upstream of gntZ allowing its independent transcription . Probably because of the absence of gluconate, the other gnt genes were scarcely transcribed, indicating that the gnt promoter was not active. Therefore, the latter promoter might be involved in the induction but is known not under CCR . It might be worthwhile to investigate its specific induction upon hyperphosphorylation of DegU. On the genetic background of the laboratory strain 168, degU32 caused accumulation of DegU-P and production of a novel 3.7-kb transcript containing rocG, suggesting that CcpA-dependent CCR was proactively abolished. In our preliminary experiments in the natto starter strain NAFM5, similar phenomena occurred as in 1A95 (the results would be described elsewhere). In 168 cells, degQ is not efficiently transcribed due to a mutation in its cognate promoter . Thus, DegU-P levels remain lower in these cells, whereas in wild-type strains such as natto starter strains, DegQ may enhance DegU phosphorylation instead of degU32 transcription. Potential to abort CCR with hyperphosphorylation of DegU may have offered survival advantageous in many other bacteria that utilize various carbon sources in environmental competition, but could have been lost during domestication to breed the laboratory strain 168. The DegS–DegU system interacts with the ComP–ComA two-component system that is involved in natural competence. Upon increases in cell density, ComA is phosphorylated and activates DegQ , suggesting a shared function of DegQ in the ComP–ComA and DegS–DegU systems. However, unphosphorylated DegU is essential for the expression of the competence transcription factor encoded by comK ; and thus, hyperphosphorylation of DegU may restrict natural competence as unphosphorylated DegU decreased. Because strain 168 was selected for its high natural competence, the degQ promoter may have been mutated to avoid accumulation of DegU-P enhanced by DegQ following activation of the ComP–ComA system. The present northern blotting analyses of the rocG locus suggested constitutive transcription from the sivA promoter (Figure 2B). However, this transcription is not completely terminated at the Rho-independent terminator (Figure 3C) and is usually aborted at the downstream cre site via the CcpA-dependent CCR roadblock mechanism . Thus, upon alleviation of CCR, rocG may be induced immediately, leading to formation of the 3.7-kb transcript shown in 1A95 cells, which may represent a novel mode of CcpA-dependent regulation to induce the target gene. In this study, it was implied that hyperphosphorylation of DegU induced lctE through unknown mechanisms to decrease intracellular FBP levels earlier and thus proactively cancelled the CCR roadblock. Potentially, this mode of regulation may operate at the global level, as suggested by transcriptome (Table 1) as well as the other northern blotting analyses (Figure 8). The physiological significance of this mechanism requires further investigation. The 3.7-kb transcript covering sivA, rocG, and rocA may be tightly controlled under physiological conditions by a roadblock mechanism involving P-Ser-HPr/CcpA in 168 cells, while in 1A95 cells the tight control was alleviated. Accumulation of DegU-P in 1A95 cells affects central carbon metabolism involving lctE enhanced by unknown mechanisms, downregulates FBP levels earlier, and inactivates HPrK to allow the 3.7-kb transcription. Similar events may occur in other catabolite repressive loci. The bacterial strains and plasmids used in this study are listed in Table 2. Strains of B. subtilis were routinely maintained on TBABG plate medium containing 3.3% tryptose blood agar base (Becton, Dickinson and Company, NJ, USA) and 0.18% glucose. To induce experimental growth, cells were precultured on TBABG plates for 16 h at 37°C, and fresh colonies were then inoculated into 30–40 ml of soytone–glucose medium containing 1.0% Bacto-soytone (Becton, Dickinson and Company), 0.5% Bacto yeast extract (Becton, Dickinson and Company), 1.0% NaCl, and 2.0% glucose (pH 7.0) in a 500-ml shaking flask at OD600 of 0.05, and were grown at 37°C with shaking at 150 rpm. The Escherichia coli strain was grown in LB medium. When required, cells were cultured in the presence of 100 μg/ml ampicillin, 0.5 μg/ml erythromycin, 50 μg/ml kanamycin, 10 μg/ml chloramphenicol, 100 μg/ml spectinomycin, or 15 μg/ml neomycin. The strains TM013 and TM014 were constructed from respective parental strains 168 and 1A95 by transformation with pGP958 plasmid DNA  harboring a chloramphenicol resistance gene cassette inactivating rocG. To construct TM015, 1A95 cells were transformed with chromosomal DNA from WTF28  carrying a chloramphenicol resistance gene cassette inactivating degU32. To construct TM016, 1A95 cells were transformed with DNA from the strain ΔrocR (FW15) , which harbored a kanamycin resistance gene cassette inactivating rocR. TM017 and TM018 strains were constructed by transformation of 168 and 1A95 cells with DNA from the strain BFS3227 (National BioResource Project; NIG, Japan; B. subtilis), which harbored an erythromycin resistance gene cassette inactivating sivA (formerly yweA) . TM023 and TM024 strains were constructed by transformation of 168 and 1A95 cells with DNA from the strain FU402 , which harbored a neomycin resistance gene cassette inactivating ccpA. MY02 and KI004 were constructed as follows: two DNA fragments (approximately 500-bp long) corresponding to the flanking regions upstream and downstream of lctE (also called ldh) were amplified using chromosomal DNA from 168 cells as a PCR template and the respective primers lctE-R2/lctE-R1 and lctE-F2/lctE-F1 (Table 3). 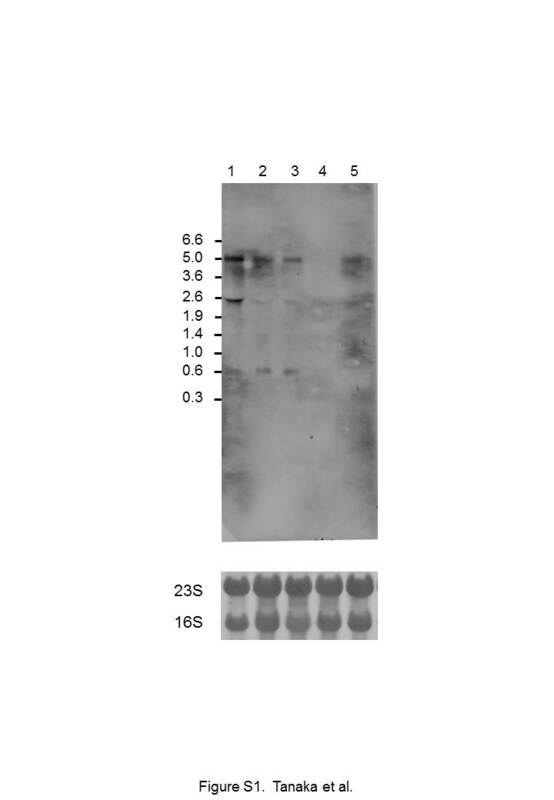 Another PCR fragment containing the spectinomycin resistance gene cassette was amplified using DNA from the strain FU341  and the primers lctE-spec-R and lctE-spec-F (Table 3). A mixture of the three DNA fragments was used as a template for PCR, and the primer pair lctE-R2/lctE-F1 was used to generate a recombinant fragment of the spectinomycin resistance gene sandwiched between the flanking regions upstream and downstream of lctE. This recombinant fragment was used to transform 168 and 1A95 cells with the spectinomycin resistance gene and inactivated lctE to obtain MY02 and KI004 strains, respectively. RNA samples were prepared as previously described  with some modifications. Briefly, cells were grown to the transition state from logarithmic and stationary phases (4 h after inoculation). Subsequently, 20-ml aliquots of the culture were centrifuged, and cell pellets were resuspended in 1 ml of LETS buffer containing 1% SDS, 100 mM LiCl, 10 mM EDTA, and 10 mM Tris–HCl (pH 7.4). After addition of 500 μl of glass beads (φ0.5 mm) and 1 ml of phenol:chloroform:isoamyl alcohol (25:24:1), cells were disrupted with vigorous shaking and were then centrifuged. Finally, purified RNA was precipitated from the upper aqueous phase using ethanol. Northern blotting and primer extension analyses were performed as described previously . Briefly, probes for northern blotting analyses were prepared using in vitro transcription with T7 RNA polymerase from template DNAs of PCR fragments that were generated using the following respective primer pairs (Table 2): rocG, NrocG-F/NrocG-R-T7; sivA, NyweA-F/NyweA-R-T7; rocA, NrocA-F/NrocA-R-T7; ltcE, NlctE-F/NlctE-R-T7; ptsG, NptsG-F/NptsG-R-T7; licC, NlicC-F/NlicC-R-T7; and dra, Ndra-F/Ndra-R-T7. Hybridization was performed for 16 h at 50°C (lower stringency) or 55°C (higher stringency). In primer extension experiments for the sivA promoter region, RNA samples were subjected to reverse transcription using the specific primer PEyweA-R (Table 2), which was 5′-end labelled with [γ-32P] ATP (GE Healthcare Bio-Sciences, NJ, USA) using a MEGALABEL kit (Takara Bio Inc., Otsu, Japan). Sequence ladders were produced from the same primer using dideoxy sequencing reactions, and the template PCR fragment was amplified from the 168 strain using the primers PEyweA-F and PEyweA-R (Table 3). Transcriptome analyses were performed using a high-density tiling oligonucleotide chip as described previously . Briefly, cDNAs were synthesized from RNAs and were labelled and hybridized to the oligonucleotide chip using established methods . To compensate for differences in hybridization efficiency of 25-mer oligonucleotide probes on the chip, hybridization intensities of cDNAs were divided with that of total genome DNA. Normalized transcriptional signals were processed and analyzed using the In Silico Molecular Cloning program, Array Edition (In Silico Biology, Yokohama, Japan). The data are available in the ArrayExpress database  under accession number E-MTAB-2944. Metabolic intermediates of central carbon metabolism were determined in 168 and 1A95 cells grown on the soytone–glucose medium. At the indicated time points, 10-ml aliquots of bacterial cultures were quickly mixed into 14 ml of methanol at −40°C, and the mixture was then incubated for a further 15 min at −40°C. After centrifugation at 7,000 rpm for 5 minutes at −20°C, the supernatant was discarded and 7.5 μl of 100 mM adipic acid and 7.5 μl of 1 mM 1,4-piperazinediethanesulfonic acid were added to the remaining cell pellets as internal standards. To extract metabolites, cell pellets were disrupted with vigorous mixing in 1 ml of 75% (v/v) ethanol that was preheated to 95°C. Extracts were then evaporated under vacuum and subjected to the CE–MS analysis performed as previously described . Ammonia contents of culture media were measured using an ammonia assay kit (Sigma-Aldrich, MO, USA) according to the supplier’s instructions. The plasmid pGP958 was provided by J. Stülke. The strains ΔrocR (FW15), WTF28, FU402, and BFS3227 were kind gifts from M. Débarbouillé, K. Kobayashi, Y. Miwa, and National BioResource Project (NIG, Japan), respectively. We thank S. Kada for measuring ammonia levels in culture media. This work was financially supported by the Ministry of Education, Culture, Sports, Science and Technology, Japan; in parts by Special Coordination Funds for Promoting Science and Technology, Creation of Innovative Centers for Advanced Interdisciplinary Research Areas, by the Advanced Low-Carbon Technology Research and Development Program, by KAKENHI (26660067), and by Grants-in-Aid from the NC-CARP project. Additional file 1: Figure S1. Northern blotting analyses of transcripts containing rocB RNAs were prepared from 168 (lane 1), 1A95 (degU32, lane 2), TM015 (degU32::cat, lane 3), TM016 (degU32 rocR::kan, lane 4), and TM024 (degU32 ccpA::neo, lane 5) cells. The rocB-specific probe was prepared using in vitro transcription with T7 RNA polymerase from the template DNA of PCR fragment that was generated using the primer pairs of NrocB-F (5′-aatcaggcgagtggatgttc-3′) and NrocB-R-T7 (5′-taatacgactcactatagggtattgtggagacggcttgtg-3′). rRNAs (23S and 16S) on membrane were visualized as a loading control using methylene blue staining. KT, KI, TMo, TMa, OC, and SI carried out the molecular genetic studies including the transcriptome and CE–MS analyses, and participated in drafting the manuscript. TH supervised the CE–MS analysis. ST, NO, and KY coordinated the collaboration. KY conceived of the study, conducted it, and prepared the final manuscript. All authors read and approved the final manuscript. B. subtilis Expression Data Browser. INRA-MIG. Gene/Segment: rocA Locus Tag: BSU37780. http://genome.jouy.inra.fr/cgi-bin/seb/viewdetail.py?id=rocA_3878966_3880513_-1. Accessed 16 Jan 2015.